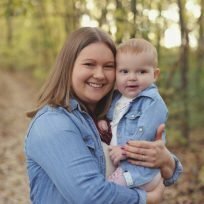 I was under an enormous amount of stress just trying to get pregnant with my daughter, so the last thing I wanted to do was become the crazy pregnant lady. I knew I needed to distract myself from the fact that my life was about to change forever and let me tell you, it didn’t seem easy at first. I was feeling totally inept at being a mom, but I knew all this anxiety wasn’t good for my mind and heart. So I decided to take some steps to change things so I wouldn’t lose my mind during pregnancy before the baby even came.